People often ask me what being OUT LOUD actually means and I have to admit I sometimes have difficulty finding the words to explain. There is nothing diluted about her, nothing toned down or modified in case she offends or upsets anyone. She is completely herself, every fibre of her being declares she is a daffodil. Sometimes I meet a woman and I know she is just not OUT LOUD – she is hiding herself away, has turned down her volume, is frightened to be completely who she really is. Perhaps she gets a bit quiet when her opinions are challenged or is reluctant to fully be herself in the workplace in case that’s unacceptable. Maybe she takes a back seat in meetings, wants to express her views but is worried what others might think about her. Or she’s a mother who’s decided to stay at home to raise her kids and feels ashamed of her choice. Or a middle aged woman preoccupied with aging and wondering if she needs to behave or dress more appropriately. Others on the other hand – just like this daffodil – are resolutely, triumphantly OUT LOUD – you feel their energy when you talk to them, their gaze is unflinching, their sheer presence demands you hear and see them. They make no apology for their existence and don’t play by anyone else’s rules – they are simply themselves and they are eager to engage with the world. They put two fingers up to convention, really don’t give a toss what other people think, dress how they want, paint the pictures that make them come alive, write the books that give them joy, do the work they have passion for. They are not frightened to show emotion and will stand up for the people they love and the principles they believe in. To them age is just a number and life is to be lived. 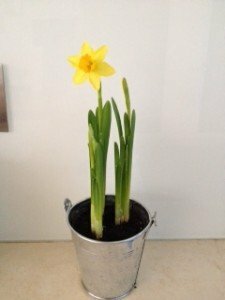 Do you know an OUT LOUD woman who reminds you of that gorgeous, bright daffodil? Tell us about her here – you could also upload a photo of her on our OUT LOUD facebook page. And feel free to nominate yourself – let’s gather as many OUT LOUD women as possible and make 2014 an OUT LOUD year to remember.